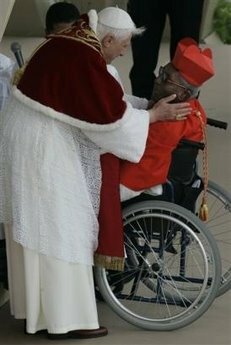 Peter Poreku Dery, archbishop emeritus of Tamale, Ghana is given the sign of peace by Pope Benedict XVI after being made a cardinal. 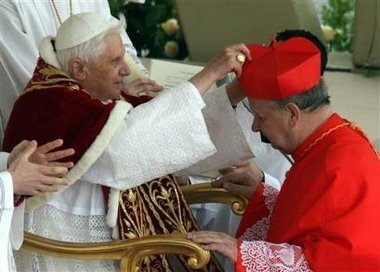 In one of the more shocking commentaries I've heard, the American commentator used this episode to remark and I paraphrase "Isn't it strange to see the pope getting up to aid a cardinal who is bound to a wheel chair as opposed to the pope himself being bound to a chair," (a reference to the late Pope John Paul II). 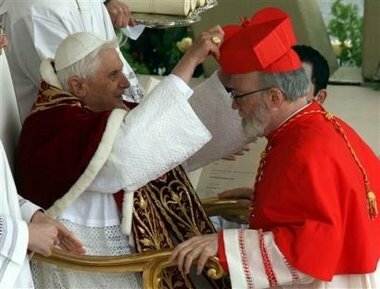 I would note that the only two cardinals that the pope arose out of his seat to greet (and in this case to make Archbishop Dery a cardinal) were Archbishop Dery and Archbishop Levada--the latter clearly as a sign of the friendship between the two men. Something that my Rome trip has given me is a new understanding of the churches of Rome, so that in this morning's ceremony when the pope announced to each new cardinal their titular church in Rome, I knew not only what he was saying but also where they are and what they are like.